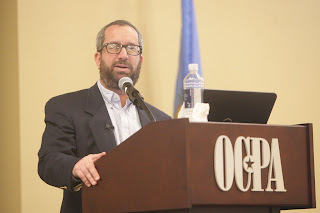 Jay Greene speaks in Oklahoma City on December 3, 2015. One excellent idea being proposed in Oklahoma is for policymakers to do what eight other states have done: enact an individual tax credit or deduction for approved educational expenses (including private school tuition and homeschooling). Policymakers should embrace this idea. But whichever new ed-choice program Oklahoma policymakers decide to enact next—whether it's an individual tax credit, or a scholarship for foster kids, or an education savings account, or whatever it may be—policymakers should resist the temptation to means-test the program. Means-testing would be bad politics and bad policy. In 2014 and again in 2015, pollsters asked registered Oklahoma voters whether educational choice should be available to all families or should be means-tested. A Braun Research survey, for example, asked if ESAs should be available only to those in financial need; Oklahomans rejected that idea by a margin of 53 percent to 37 percent. But when asked if ESAs should be available to all families, Oklahomans overwhelmingly (58 percent to 32 percent) said yes. Rather than lament this fact, reformers should try to use it to advance their goals. The old political adage that programs for the poor tend to be poor programs is all too true. Reformers have made horrible political mistakes in concentrating programs in disadvantaged areas, means-testing participants, and focusing on options that are mostly of interest to lower-income families. Not only do these program tend to be less-well funded, overly regulated, and generally of lower quality, but they are always highly vulnerable to being weakened further or eliminated. To increase the odds of having better quality programs that are more generously funded and more reasonably regulated, reformers should be sure to include higher-income families as potential beneficiaries. And those wealthier families are more likely to be mobilized politically to protect and expand programs. If reformers should seek to organize concentrated interests of beneficiaries, it would really help if they did not exclude higher-income families that tend to have better resources, networks, and experience to participate more effectively in politics [emphasis added]. Professor Greene reiterated the point yesterday, explaining why charter-school expansion is likely to lose at the ballot box in Massachusetts on November 8. Education researcher Matt Ladner also has some helpful insights. For example, he reminds us that public school eligibility is universal. So, for example, if an Oklahoma billionaire could send his kids to get a $10,000-per-year education at a suburban public school, what’s so awful about a $1,000 tax credit if that parent decided to homeschool or choose a private school instead? What's so awful about a $5,000 voucher or ESA? Why should a homeschooling Edmond heart surgeon be excluded from receiving a tax credit? Why should a Tulsa oil-and-gas entrepreneur who sends his kids to Victory Christian School be excluded from getting a voucher or an ESA? After all, as Dr. Ladner reminds us, they pay more taxes than most other people, both directly and indirectly by creating jobs and creating companies that also pay taxes. Since when do GOP politicians want to make enemies out of a key portion of their base? If states like Indiana, Iowa, and Louisiana can enact tax credits with universal eligibility, there’s no reason Oklahoma cannot do the same. Heck, even purple Wisconsin and deep-blue Illinois have tax credits with universal eligibility. The education establishment is going to fight this idea no matter what. They’re going to demagogue it as “school choice for the rich” no matter what. So there's no reason not to aim for the ideal policy. If it turns out that the sausage-making process demands compromise, a better route for the individual tax credit would be to keep the eligibility universal but use a graduated scale that gives a larger tax credit for lower-income kids. A better route for the ESA would be to limit it geographically rather than by income. If the Massachusetts charter school ballot question fails (which it did), Robert Pondiscio writes, "don't point angry fingers at selfish Massachusetts voters: Blame falls equally upon a movement that has long been a bit too enamored of its own civil-rights-movement-of-our-time rhetoric to worry much about building a constituency among the middle class." AEI scholar Katharine Stevens has an interesting observation about why the folks promoting early-childhood development (prenatal through age 3) for disadvantaged people hitched their wagon to the universal pre-K star. "I think there may be a political calculation," she says. "If you’re promoting something universal, you will stand a much better chance of getting public support. ... Disadvantaged mothers and infants do not have huge interest groups or lobbying organizations."